If you are looking for a company who mounts and frames newspaper and magazine articles professionally you have found us we are In The News Inc. When you or someone you know has a moment of fame captured in a magazine or newspaper article, using a frame company to laminate it has never been easier. You can now frame newspaper articles without having to run to a newsstand, magazine rack or the publisher for tear sheets. An online company in Florida, In the News, provides framing services over the Internet and receives copies of almost all newspapers and magazines in the U.S.
Getting an article laminated and framed preserves it for decades to come, if not longer. 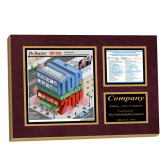 All kinds of businesses use a frame company to preserve important news and achievements and display them on office or lobby walls. Being recognized in the press for positive accomplishments is something to be proud of and when you can order these displays without leaving your computer, you may have discovered one of the easiest ways to reward someone for the accomplishment. Besides the common use of these laminated plaques in a business environment, being able to order from a frame company directly makes it much easier for individuals to frame newspaper articles. Whether you want to preserve an article about yourself or a loved one, In the News makes it so much easier to do so. A great company like In The News guarantees your satisfaction, so there's nothing to risk. First-time clients have a 10-day period in which to review their plaques and do not receive a bill until the end of the review period. Customers can also order as many plaques as they want of a particular article and if the quantities are large enough, may be able to receive a group discount. These commemorative plaques make thoughtful and unique gifts for anyone who is the topic of an article or contributed to it, whether it's through writing the article or providing the photography for it. Kids who participate in sports or music will appreciate reminders of their hard work when they grow older when you preserve a newspaper or magazine clipping about their awards or honors on a commemorative plaque. The grandparents are likely to treasure something like that as well, giving them extra bragging rights. Knowing that it's so easy to frame newspaper articles opens a completely new dimension for recognizing the accomplishments of anyone, whether it's you, a business associate or friends and family. The service In the News provides adds a whole new dimension to preserving memories that everyone can appreciate.